Since the publication of its first edition in 1999, The General Principles of Hong Kong Law (in Chinese) has been well received by readers. The 2nd edition of the book was published in 2009. The 3rd edition has now been published. 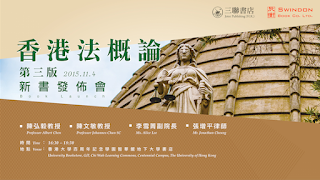 It is co-edited by Professors Albert Chen, Johannes Chan and Alice Lee of the Faculty of Law, HKU, and solicitor Mr Jonathan Cheung. A book launch for this book will be held at 4.30 pm this Wednesday, 4 November 2015, at the University Bookstore, Centennial Campus, HKU. 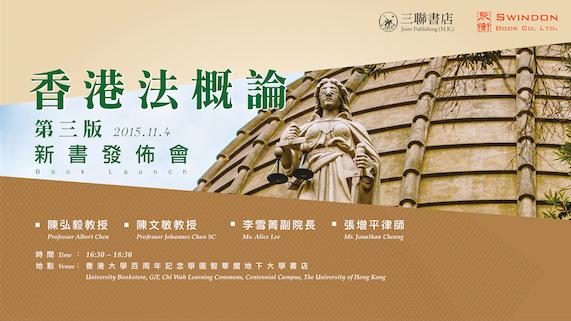 At the book launch, the editors of the book will introduce the objectives and content of the book, and share their views on relevant developments in the legal system and Rule of Law in Hong Kong. The event will be conducted in Cantonese. All are welcome. Joint Publishing (Hong Kong) Company Limited.